Barely off the assembly lines and the new Santa Fe Sport has already been named one of the "10 Best SUVs Under $25,000 for 2014" by KBB.com. Along with being "competent, stylish, efficient" and affordable, the SUV offers lots of features and an unbeatable warranty, according to Kelley Blue Book's most recent Hyundai Santa Fe Sport review. All of these factors and more have earned it a strong following and top position in the crowded midsize SUV class. 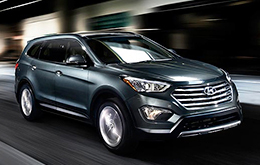 Shoppers in the market for a family-friendly utility vehicle can find the 2014 Hyundai Santa Fe and Santa Fe Sport for sale in Dallas-Fort Worth. Visit our dealership in Carrollton to explore base, 2.0 Turbo, GLS and Limited trim levels. The lineup features three engines and three seating configurations to accommodate a wide variety of needs when it comes to performance and capacity. Powerplants include a 190-hp four-cylinder, 264-hp turbocharged four-cylinder and 290-hp V-6, while seating is offered in five, six or seven passenger layouts depending on the selected trim. New luxury appointments and safety technologies have been added for 2014, including 18-inch wheels on the Sport 2.0 Turbo, available rear side window sunshades on Sport models with the Premium Package and a blind spot detection feature, which is now optional on all trim levels. Additionally, Santa Fe's Technology Packages add ventilated front seats, integrated memory seats and a rear parking assistance system. 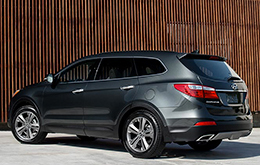 Learn more about these and other features when you come test drive the 2014 Hyundai Santa Fe in Carrollton, Texas. For full details about standard amenities and options, please contact a sales rep today or visit the digital showroom on our website. A video tour of the SUV is included at the bottom of our review. Watch it now to see footage of the Santa Fe's well-designed cabin and athletic exterior styling. We're condifent that the Santa Fe is perfectly built for you. 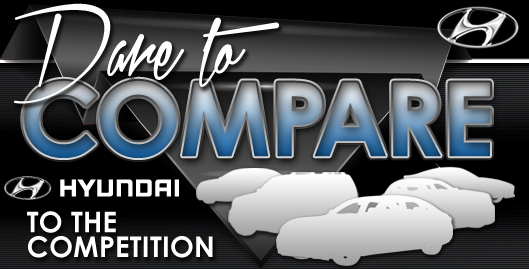 That's why we dare you to compare Hyundai's latest model head-to-head with the 2014 Chevy Equinox, Toyota RAV4, Kia Sorento, Ford Explorer and the Honda CR-V. The Santa Fe's got several enticing qualities, including its advanced features and sharp styling. Hundreds of Dallas Hyundai drivers choose it because it's a phenomenal value; just compare its price to the opposition. Find even more details about what it offers; see our quick-facts list for the Santa Fe - bullets under this text. 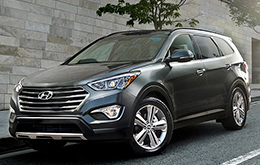 Thank you for reading Van Hyundai's 2014 Santa Fe review! We stand out from other dealers by offering reviews provided to assist you in your vehicle search. As you read this article, you'll see that it is bundled with up-to-date information about all the things you're looking for in the new Santa Fe - cabin features and other specs included. Is the Santa Fe not the right choice for you? Find out more about other vehicles on sale at Van Hyundai using our reviews archive. With it you can review and compare Hyundai's entire portfolio of vehicles.